Woody and June Wednesday… Ready. Set. Go! Post-Zombie Apocalypse Reporter, Aleia O here. Checking in after what I would call the ‘Flagstaff Snowpocalypse of 2019’, I’m happy to report that we have seen a few signs of Spring. The snow is still piled high in places, but we can see the ground around our home which Olivia really enjoys. Here she is using her tunneling skills; adorable! I’m not going to get ahead of myself with Spring fever yet because the weather folk are saying another foot may be coming this week. Hmmm, good thing we have shovels and plows here. I suggested to Robert that he write an episode where Woody and June need to slog through four feet of snow and take a little rest at the historic Little America Hotel in Flagstaff. At any rate, as President of the Woody and June Fan Club, I’m excited to announce that today is the big day! We are releasing Episode #1 of the Woody and June series to the general public (it’s on sale for $0.99 until episode 2 comes out). If you are a member of the Fan Club, you may have already received and read the pre-release copy of Woody and June versus the Wannabe Warlord. If you did, and if you enjoyed it, please share the word with your friends, and/or write a review (at Amazon.com, Barnes & Noble, Kobo, and others). If you have not received your copy yet, you can do that here. If you are not already a member of the Fan Club, you are now cordially invited to join! I’ll be offering regular reports about how the apocalypse is going and how Woody and June are doing. Fan Club members will receive FOR FREE, the first episode, Woody and June versus the Wannabe Warlord. You’ll get free stuff like digital wall paper and Zombie Arizona post cards. You’ll also get a behind-the-scenes view of all things Woody and June. Our team has enjoyed a lot of laughter while brain-storming (no pun intended there) about the first fun merch item for this post-apocalyptic zombie romantic adventure. 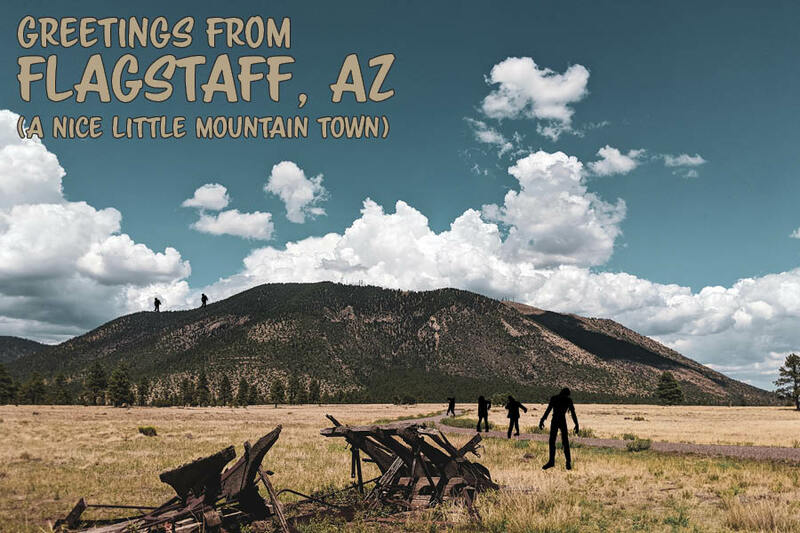 Robert designed a Flagstaff, Arizona post card with his own photo of Mt. Eldon. He added a few zombies and a clever tag line that will make you smile. If you want to receive a snail mail post card with hand-written messages from Woody and June, you can provide your snail mail address here. We promise not to mail any other item or share your information with anyone else (although we will add you to the Woody and June Fan Club, since this is a fan club only kind of thing). Let the adventure begin!